Security and justice are essential to countries in sub-Saharan Africa. They create an environment in which poverty-reducing development can occur and help reduce the incidence of violent conflict. People and the communities and states they live in will not develop economically, socially, or politically without an environment of safety and security or without equitable access to justice. 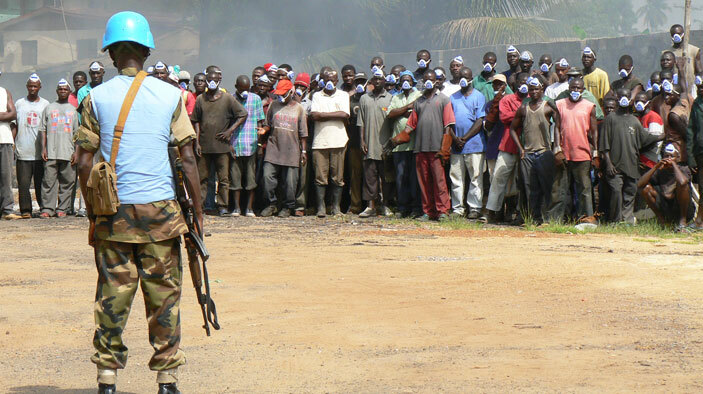 The Access to Security and Justice Programme (ASJP)worked with the government of Sierra Leone to consolidate peace and stability by increasing access to responsive, accountable, and effective security and justice services, especially for the poor, vulnerable, and those living in remote and marginalized areas. ASJP focused on local ownership, on ensuring sustainability of the reform process, and on enhancing security and justice service provision outside of the capital, Freetown, especially in remote areas. The program was designed to align with the government of Sierra Leone’s Justice Sector Reform Strategy and Investment Plan and to pay particular attention to the needs of women. Supported cross-sector coordination, monitoring, and evaluation of justice sector institutions and stakeholders. Assisted justice and security sector ministries in developing strategic policy making and service provision. Strengthened Family Support Units in local police stations to deal more effectively with sexual- and gender-based violence. Strengthened security and justice provision at the community level. Supported the Sierra Leonean police to ensure effective security management arrangements are in place for the 2012 elections. Improved case management and reduced case backlog. Streamlined management of prisons, linking safety, security, and justice service delivery mechanisms, particularly reducing backlog due to the increasing number of remand prisoners. Supported the government of Sierra Leone strategy for national provision of accessible legal aid, paralegal services, and mediator dispute resolution. Developed systems to improve effectiveness, efficiency, accountability, and oversight across the justice and security sector.